Excellent for pasta, seafood, soups, stews, and rice; this multi-cooker boils, steams and blanches. Simply lift out the deep pasta insert after the pasta has cooked. No need to pour hot water into a separate colander. This is much easier and safer. 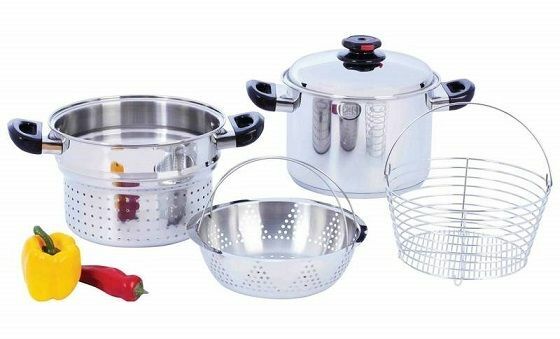 Set includes: 8qt stockpot, cover with Steam Control' top knob, pasta colander, deep fry basket, and 4-3/8" steamer basket. All 3 inserts can be used alone in the 8qt stockpot or the pasta insert & steamer basket can be used at the same time. All pieces store together inside stockpot. Limited lifetime warranty. White box.